Much better than last year in that there are (if I counted right) only 11 back-to-backs. And the first 3 are @ home and the last 2 are @ home. More Pens friendly than last year. Last edited by Big Easy Pens Fan on Thu Jun 21, 2018 5:48 pm, edited 3 times in total. 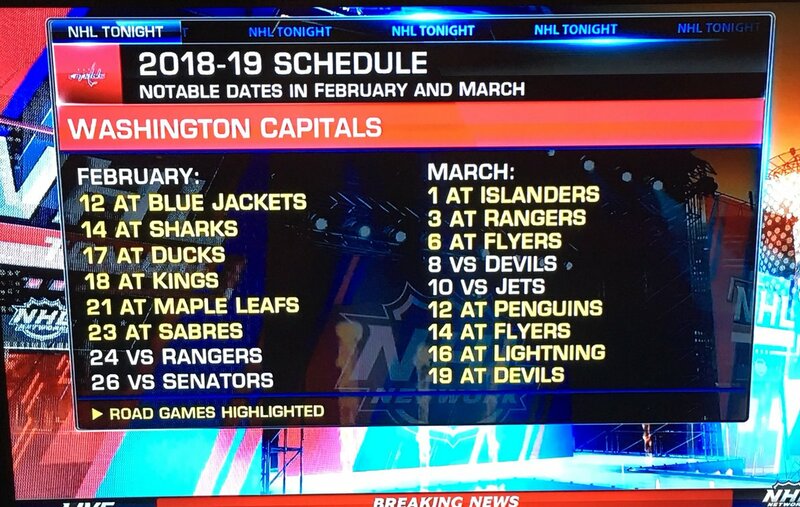 CAPS have 12 back to back games, but they have a brutal looking Feb/March. Kinda bummed they are doing all the west coast stuff in one trip. Last year it was Vegas/Ariz and then a separate trip for the CA coast. Having a condo in Vegas I plan to fly down for the game like I did last year, and we also flew a month later to San Jose for the game there. They are so close together that I'm not sure we are making both this year I even just purchased a faster plane that will seat 6 hoping to take the kids along to the games and really wanted to do both Vegas and San Jose, not sure we are going to do that now especially if some of the kids can't get off work. Might consider doing the Anaheim/LA back to back though and then Vegas the following weekend. First Post ! Schedule is better than last years . MikeTPens12 wrote: First Post ! Schedule is better than last years . OKAY!!! Welcome to the board. Don't be a stranger. And most important, have fun!!! pcmforless wrote: Kinda bummed they are doing all the west coast stuff in one trip. Last year it was Vegas/Ariz and then a separate trip for the CA coast. Having a condo in Vegas I plan to fly down for the game like I did last year, and we also flew a month later to San Jose for the game there. They are so close together that I'm not sure we are making both this year :( I even just purchased a faster plane that will seat 6 hoping to take the kids along to the games and really wanted to do both Vegas and San Jose, not sure we are going to do that now especially if some of the kids can't get off work. Might consider doing the Anaheim/LA back to back though and then Vegas the following weekend.